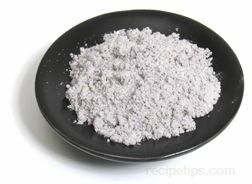 A flour-like substance that has larger granules than regular flour and is produced from grinding dried kernels of yellow or blue corn. Yellow or blue cornmeal can also be ground to a finer consistency and sold as gluten free flour that is used to make cornbread, muffins, pancakes, polenta, and tortillas. Cornmeal is very useful for gluten-free quick breads. Baked goods have a coarse, gritty texture with a granular crumb and a flavor of sweet corn. 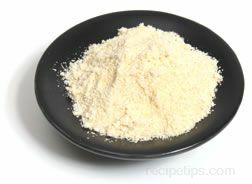 Freshly ground cornmeal is best, especially if it is stoneground, because it has more flavor than cornmeal ground using other methods. Because cornmeal contains no gluten, it must be blended with wheat flour in order to form a bread loaf.